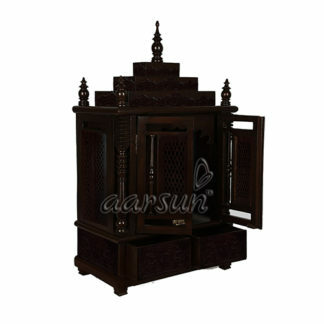 Aarsun Woods have a range of traditional and simplistic designs in Wooden Temples. The Temples can be folding and fixed as per the buyer’s requirement. The units are carefully handcrafted keeping in mind the religious aspects as well as sentiments related to the Prayer Units. This particular Temple is a made-to-order design with a blend of North as well as South India. The temple have traditional carving over the surface which can be commonly seen in North India while have a step by step Stupa design depicted from the Temples in South India. The overall look brings North and South together. The Temple has doors in Front with Jaali / Net pattern. Each Step at the top has Aum / Om carved out in front with floral pattern similar to the design at the drawers beneath the Grabgriha (Center where the idols are placed) and at the sides. The whole Temple rests on 4 stands at the bottom. The Prayer Cabinet is polished in Dark Walnut Finish. However, the Temple can be polished in Natural Rosewood, Light Walnut or Dark Walnut finish as per need. Each home has a different set up and Vastu and according to the religious as well as astrological aspects, some or whole of the design and make can be changed as per your requirement. 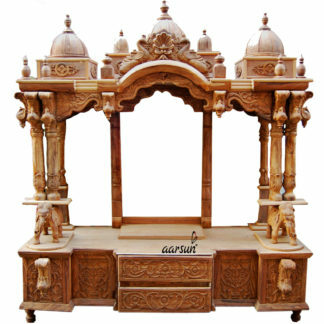 The Temple is made from premium quality Teak Wood or Sagaun as it is called in many parts of India. Teak Wood is one of the most widely used hardwood used in Handcrafted Furniture and other handicrafts. In case you are looking for Sheesham / Rosewood Temple , Designed Wooden Mandir, also at Sheesham Wood Temple / Mandir by Aarsun.